Do you have a childhood hero? Not an animated one, but a real life, flesh-and-bone hero? Were you lucky enough to have someone in your life who sought you out when you didn’t fit in, when you celebrated something great and all the moments in between? I did. 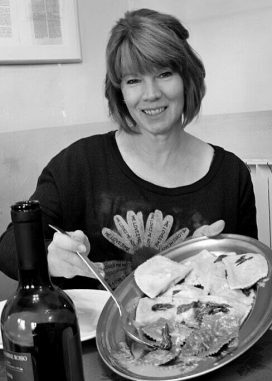 (And, no, it wasn’t Julia Childs.) Her name is Donna. She is my cousin, and she is about 10 years older than me. I don’t say that to call her out on her age now. I say it because when you are a kid, having someone “older” think you are cool kinda makes you cool! As I write this, I am visiting my mom and preparing dinner for my brothers, sisters-in-law, and a couple of my nephews and nieces. When deciding what we would have to eat, I had a big ol’ craving for Donna’s Ham and Cheese Sandwiches. I’m sure that means absolutely nothing to you other than a sandwich with ham and cheese, but in our family, these words are enough to make mouths water. It also takes my brothers and I back … way back … to our childhood … well, my childhood and their early teen years. My mom had undergone a surgery and Donna came to stay with us and to help her. And by “help her” I mean make sure my brothers stayed out of trouble and clean up after them. I was perfect (I love creative license!). Donna was a big help to my mom. She had two sisters (whom I also claimed as sisters) and thought being around “brothers” was great. I LOVED having Donna around. She defended me from them. One night for dinner she made these baked ham and cheese sandwiches. We could not get enough of them. 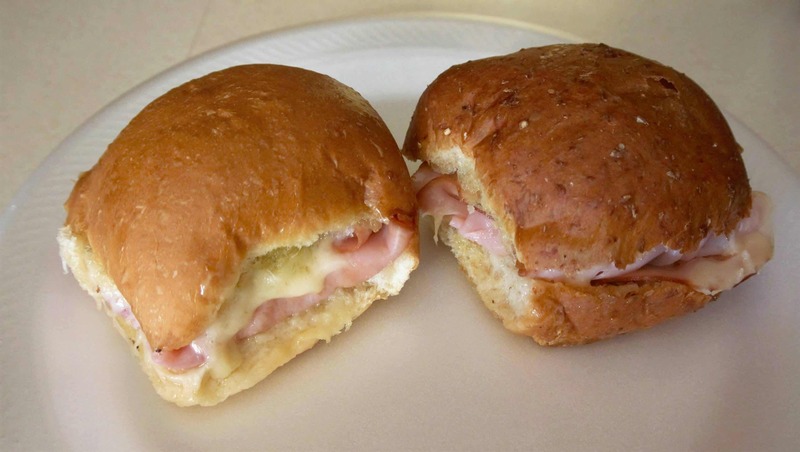 Yes, there’s ham and cheese involved but it’s the mixture that you brush on the cut sides of the bun that now invokes memories of all things good. 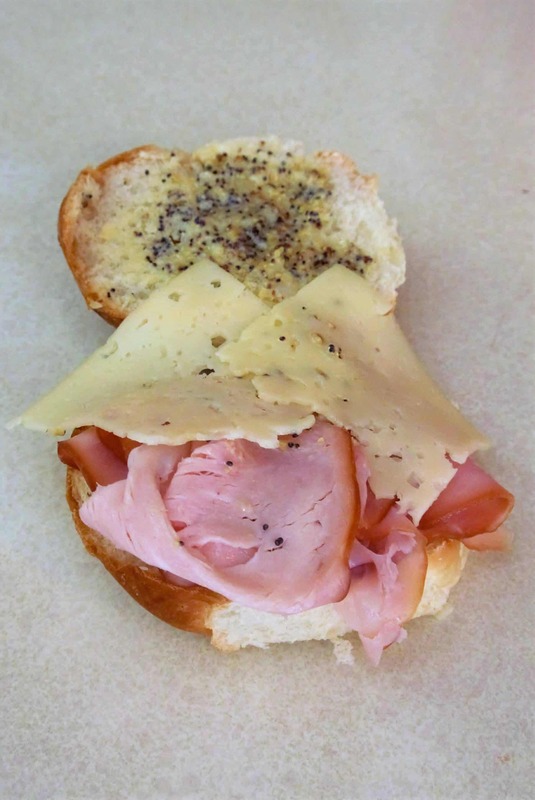 Right now, I have that mixture cooling on the stove and the smell of it just brought my mom down the hall and into the kitchen saying “mmm, that smells good!” A combination of butter, horseradish, mustard, onion and poppy seeds that hits all the right taste buds with the ham and Swiss cheese. 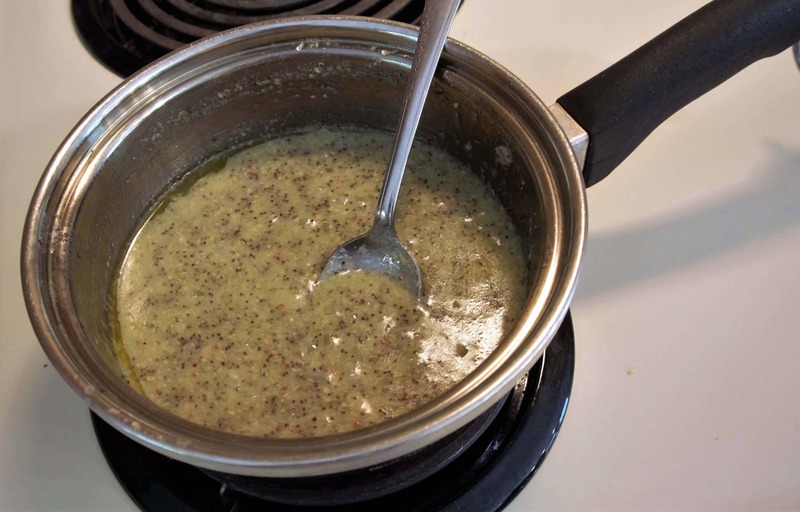 You can use a combination of horseradish and mustard or horseradish mustard itself. The horseradish is not the dominant flavor in this mixture as you might think. Did I mention these sandwiches are served warm and toasty? Uh … yeah! A triple batch fresh out of the oven! Combine first four ingredients and cook over low heat until onion is tender; remove from heat and cool a bit. 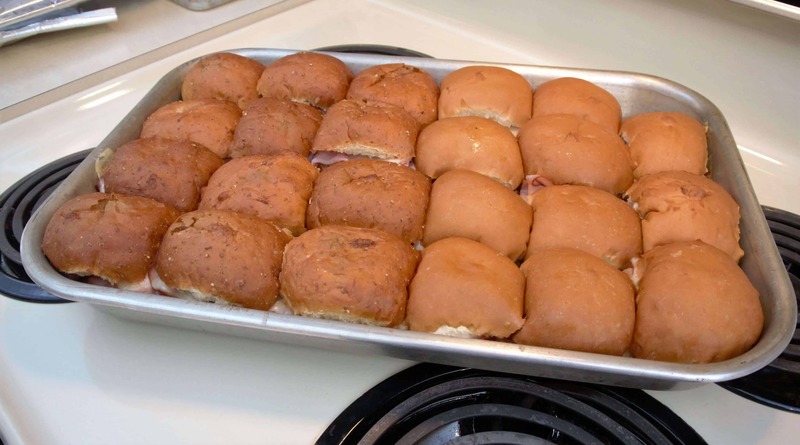 Spread mixture on inside of cut buns and add ham and cheese to each bottom half, covering with the top half. Place in a metal baking pan and cover with aluminum foil (or wrap individually in foil). Bake at 250-300º for 30 minutes. Dinner (or as my family corrects me, it’s “supper” here at the farm) is over. There are only two sandwiches left for lunch (sorry … “dinner”) tomorrow. Everyone ate plenty, laughed lots and told stories with their own creative license. It was like Donna was right there with us. 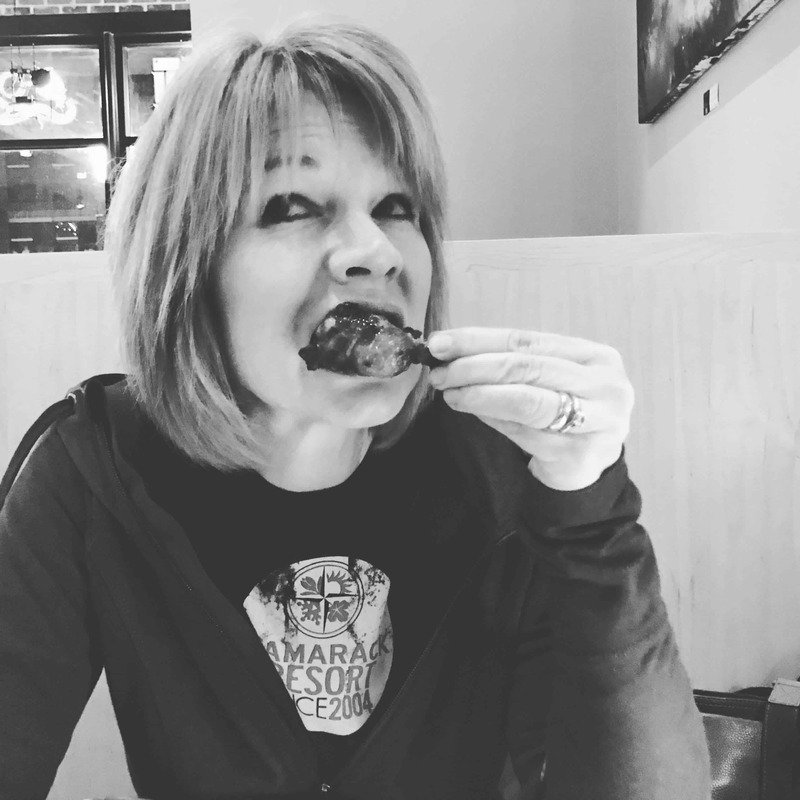 And she was … because that’s was true comfort food is. Hi Anita! Your post reminded me of a standby recipe I’ve used over the years. Slightly different but I bet very similar results. Cut the rolls in half and line the bottom of a baking pan with the bottoms of the rolls. Layer the ham slices, then cheese and place the top half back on. Mix together the butter, worcestershire, mustard, brown sugar and onion powder. Pour the whole works over the buns, drenching each one. Cover tightly and marinade anywhere from 4-24 hours. Preheat the oven to 350 degrees. Bake uncovered for 15 minutes, or until cheese is melted and bun tops are a bit golden. Sounds good … like a slightly sweeter version! Thanks for sharing.